Chatswood Toyota located in Sydney is the leading Fleet dealer and NSW Number 1 Fleet Dealer that has a dedicated Fleet team to provide the most professional and personalised service for all fleet requirements. 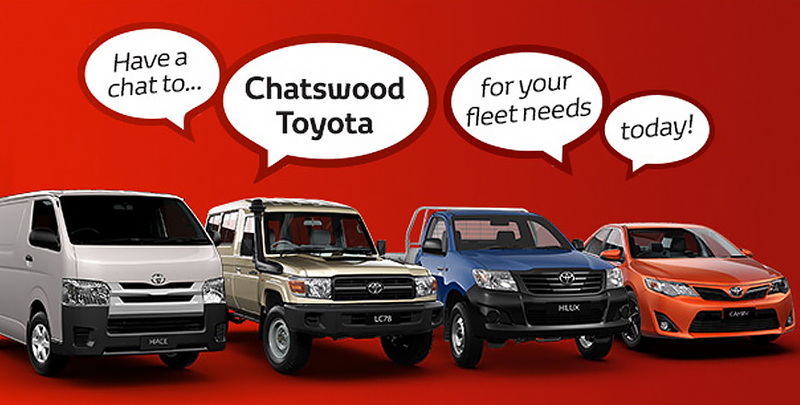 Chatswood Toyota boasts one of Australia's most experienced Fleet teams. With over 120 years combined Toyota experience, our team supplies vehicles to all industry types and all fleet sizes. From small business to large business fleets, fleet non for profit organisations & Government departments we have the right fit for your business. Our team of 5 are both professional & friendly and passionate about the services we offer. We really do take great pride in our ability to service your needs. Gino Macolino is the Fleet Sales Manager and has four experienced and highly capable National Account Managers. Gino has worked in Fleet for 20 years and has a vast knowledge in Fleet and associated services. Being one of the largest volume fleet dealers in Australia, our enthusiastic and friendly team will assist with all enquiries. Chatswood Toyota is also accredited as a Fleet Specialist Toyota Dealer and recipient of the Toyota Fleet Excellence Award. Chatswood Toyota works very closely with Toyota Motor Corporation and we are the preferred supplier to most Fleet Management Organisations. We can also assist in tailoring all needs for your Fleet including Finance and Fleet ownership solutions. Whether its one vehicle or ten or even 100, we will endeavour to meet or exceed your expectations every time. Gino and his team are serious about Fleet. At Chatswood Toyota we are also a Caddy storage stockist. Come visit our Accessory Display Centre for a huge range of genuine Toyota and Caddy storage products on display. Referral and recommendations are available on request. Please visit our state of the art Toyota dealership to view our current range of Fleet Vehicles and to meet our staff.